Michele: Being a new and unknown author, I tried for years to find a traditional publisher or agent for my manuscripts. Twenty years ago, vanity presses were outrageously expensive (I’d received a quote for $40,000.00 from one of them), so my work gathered dust in a drawer. Six years ago, I rediscovered print on demand publishers and gave it a try. It is still expensive, but a far cry from 20 years ago. Two of my novels became available through different websites, however, book stores would still not carry them on their shelves. That’s when I decide to publish my work on my own. I could format my own books and sell them through different venues on-line. I then decided that other new authors might be in the same boat that I was, so I expanded on my thoughts and now offer to publish the work of others (who are unable to publish on their own) as either ebook or paperback and distribute where I can without the high price charges that some of the major POD companies charge. I only charge when a book sells and then I split the royalties with my clients after expenses, which in some cases might be more than the 8% to 10% that traditional publishers would pay. Michele: I’ve tried several local outlets: newspaper advertising, TV/website ads: Facebook; I have a book trailer for my book, The Sin-Eater’s Daughter;book fairs and events. Trying to find the right marketing tool is an uphill struggle with a limited budget. Michele: The major challenge in self-publishing is finding a distributor that will be able to put books on book store shelves. Thus far, I am finding that unless you have hefty sales and a large bank account, finding a distributor or even getting into a major database is just as difficult as trying to find a traditional publisher/agent. Michele: If you love to write, keep doing it. Have an open mind to suggestions made by other writers. You might find their words helpful. In these days and times, if you can’t find traditional means of publication, do it yourself. If you don’t have the technical skills to do it yourself, there are publishers out there, like me, who can give you a chance for your work to get out there. Michele Hinton was born in Louisville, Kentucky and now resides in Bowling Green. She was married in 2007 for the first time at the tender age of 50. She holds a 4th degree black belt in Taekwondo and taught for many years (retired). Currently Michele is working on her Bachelor’s Degree and is expected to graduate in Oct. 2013. She won awards for her poetry from Mid-Continent University’s creative writing competitions. This year she won 1st place for her poem, Nature’s Serenade and will have several other poems published in their review magazine this year. 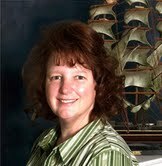 Michele also started her own publishing company in 2008 and caters to the new author. “Writing is my passion,” Michele says. Her newest books are The Sin-Eater’s Daughter, a novel, and a fully illustrated children’s book, Princess Courtney and the Magic Suit. Within the next few weeks, she will be launching an autobiography by Roy Reichelt, Jr. entitled, The Four Year Hitch on her website, www.theseashellbooks.com and it will also be available on Amazon and through Smashwords.